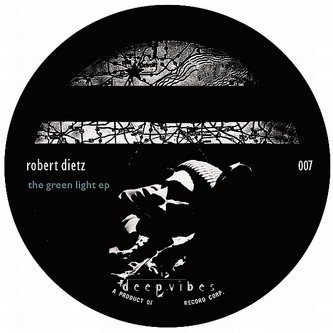 Robert Dietz follows up cool releases for Cecille Numbers and Be Chosen records with the 'Green Light' EP for Deep Vibes, displaying four tracks of affected deeper tech house. 'The Sorrow' is a sinister deep house groover with excellent sound design elements, filtering a rusty corrugated synthline over tender chords and a slow bumping bass with dubby atmospherics. 'Kanban' heads into neo-Detroit house climes similar to Drumpoet Community's Manuel Tur, with floor effective and bass heavy rhythms topped by Akufen style vocal edits adding a tidy layer of rhythmic goodness, while 'Klondike' toughens up again with darker vocals and well placed claps. The Nkotb Dub version of 'Kanban' is the best of the lot, taking the rich Detroit fed grooves of the original and applying well dubbed electronic treatments to flip it into a wicked floor worker.